People have inhabited the Canadian Arctic continuously for the past 4,000 years - in fact the Arctic was the last habitable region of the world to be occupied by people. The people of the Dorset, Thule and Inuit cultures were innovative and learned how to use the limited arctic resources to become self-sufficient. For thousands of years the Inuit and their ancestors made their own clothes, built houses, hunted, fished, and raised their families. They also supplied their own health care, recreation and education, and used dog-teams to travel great distances. When European explorers came to the Arctic looking for a Northwest Passage in the 1570's, they interacted with some Inuit villages, but did not significantly impact the Inuit lifestyle. It was during the 1800's when the whaling industry moved to the Arctic, that the Inuit lifestyle began to change. The whalers, and later on merchants and fur traders, brought new tools and technology to the Inuit, as well as devastating diseases which wiped out entire camps. Inuit life is very different in the Canadian Arctic today. The advent of satellite technology has had a profound effect on isolated Inuit Arctic communities. While strong traditional values and ethics are woven into the fabric of many Nunavut communities, Inuit are now adapting and using home computers, telephones, cable TV and the Internet. For generations the Inuit people of Nunavut lived a traditional life in the Arctic, moving from one place to another with the seasons, to hunt caribou, muskox and seal, or fish for char and whitefish. Inuit did not wander aimlessly in search of meat and fish. They visited the same seasonal hunting and fishing camps each year to harvest food. Their lifestyle was semi-nomadic moving three or four times a year. They might catch whatever they could along the way, but they always had a specific destination. Many Inuit groups would spend the winters in snowhouses on the sea ice hunting seals, springtime on the coast catching seals and fish, and summertime inland hunting caribou. In between they would harvest berries, birds eggs, fish for lake trout or cod and use whatever food nature provided. When the hunting was good, the spring, summer and fall were times to hunt and travel, while the mid-winter was a time to spend with the family, tell stories, play games, and learn about Inuit oral history and Inuit legends. The Inuit invented various types of transportation to travel in the Arctic. For most of the year the Arctic was a frozen land. The lakes and rivers were frozen, and the Arctic Ocean had 1.5m -2 m of sea ice covering it for 8-9 months each year. Walking was the most common form of transport in the Arctic. Inuit would pack their children, their hunting tools and everything they needed for the winter and walk perhaps hundreds of kilometers from a summer camp to a winter camp. They often left behind the tools and implements needed for hunting caribou and other summer activities, because they would revisit their summer camp next year, and much of what they needed would remain there. Coastal Inuit used small boats called kayaks to hunt for walrus and seals, and larger boats for called umiaks to hunt larger prey such as beluga and bowhead whales. The boat frame was sometimes made with driftwood or caribou antler and sealskin or walrus hide was used to cover the frame. Different Inuit groups used different types of kayak and umiak depending on the materials available and the prey being hunted. Today most Inuit use snowmobiles to travel on the land. For 8-9 months of the year there is sufficient snow on the land and ice on the frozen ocean and lakes to make snowmobile travel practicable. During the 3-4 months of summer, many Inuit use ATV. The trade names of "Ski-Doo" and "Honda" are used interchangeably to refer to a snowmobile or ATV. Inter-community travel is usually by airplane. Aircraft are the vital link connecting many communities. They transport passengers, mail, supplies and groceries all year, weather permitting. 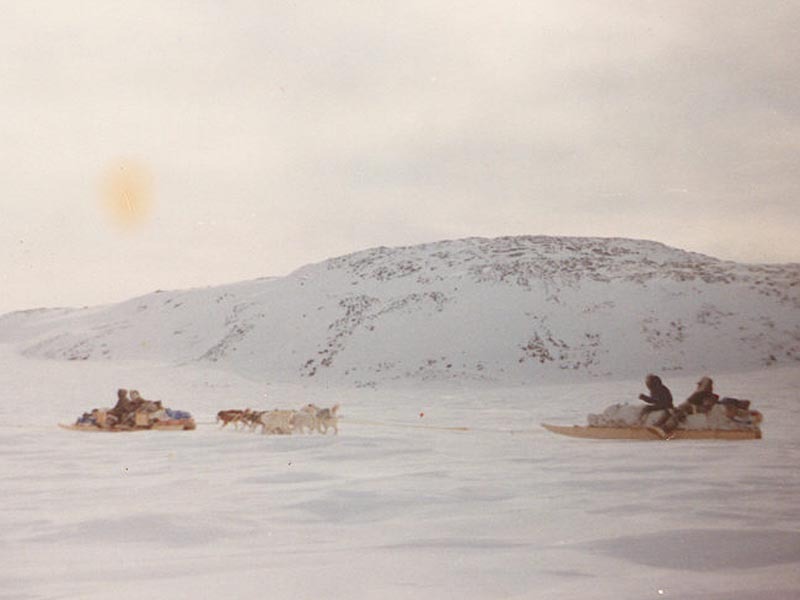 Some Inuit still maintain dog-teams, and many commercial sportshunts have to be conducted by dog-team to ensure a traditional and equitable challenge. Many people also use a boat and motor during the brief summer period when the ocean is free of ice. The ubiquitous 18' open boat with a 50hp outboard motor is a common sight in many Nunavut communities, althought for 9-10 months of the year the boat is unusable due to winter conditions. The climate dictated when and where they would move. An early spring meant the caribou could migrate early. A late spring and cold summer meant the caribou might be late or change their migratory route altogether. Tradtionally caribou would be hunted at a river crossing or from a caribou blind. Using bow and arrow or spears the Inuit hunter had to get close to the caribou for a successful hunt. When caribou migrated in large herds, sometimes hundreds of thousands they were easier to catch, and so timing was important. The Inuit camp had to be established and ready for the caribou migrations coming North in the spring and South in the fall. If they missed a fall harvest the camp might go hungry or even starve during the winter. When an animal was caught, the camp shared the food equally. Sharing and interdependency were traits of the traditional Inuit economy. Within the camp there were different people with different skills. One man might be a good seal hunter, a lady might be a good maker of waterproof footwear, and another may be good at making tools. All these skills were needed for the camp to survive, as well as good navigators, good shamans, and a variety of other skills. No one individual had all the skills necessary, and the survival of the group was dependent on the skills and abilities of the individuals. Similarly if a hunter were injured, his family would be provided with food and care until he recovered. Camp size was determined by the number of animals (food) in the immediate area, to support that camp. Too many people and not enough food meant the camp would have to split up, with one group moving to a new location. If there were lots of caribou and seal, smaller camps could unite and families could afford to have more children. Today Inuit still maintain elements of sharing and interdependency in their culture, but life has changed and Nunavut today has adopted a wage economy. The need for income to purchase groceries, pay mortgages, and buy boats, ATV's and Ski-Doos has encouraged many Inuit to take jobs with the Nunavut government and municipal governments. The Canadian dollar has become the medium of exchange. There is still significant sharing when caribou and seal are available, but the population of many Nunavut communities is too large to live off the land. A traditional camp the size of an average Nunavut community would not survive. There are too many people and not enough resources in the local area. The camp would likely have to breakup, the people disperse into smaller camps and spread out over a larger hunting and fishing area. The centralization and urbanization of Canadian Inuit into 28 Nunavut communities has eroded traditional and cultural pursuits and values, but has facilitated the delivery of contemporary education, employment and health care. The Inuit lived in small communities numbering several households. During a lifetime an Inuk might encounter a few hundred people. Most of these would be relatives of one kind or another. Relatives were obliged to share with each other. So the more relatives you had, the better your chances of survival. Virtually everyone became a relative and was subject to the same bonds, expectations and obligations as blood relatives. The basic unit of Inuit society was the family. A household might consist of a wife and husband, unmarried children, an adopted child, and maybe someone's widowed mother or a widowed sister. The oldest active male was the family spokesman. A cluster of several households of related people formed the next unit, the hunting group. Within this group there was no single leader, and decisions were made by consensus. But different leaders would emerge with a number of specific skills, such as navigating during a storm or locating a caribou herd. The size of the hunting community depended on the resources of the area; if there were plenty of game or meat, the groups could contain six to 10 families. When food was scarce this hunting group would break into smaller camps. The overall regional community, consisting of various scattered hunting groups, made up the outer limits of kinship bonds. As households or individuals moved around on the land, they could rely on the help of relatives in the other hunting communities who were part of the same overall regional community. Today Inuit live in 28 small communities throughout Nunavut. The home environment is climate controlled. The Government provides housing, health care, education, employment opportunities and social services. The government support system attached to centralization and urbanization has meant that family size is not dependent on the physical environment. Societal relationships are not as highly correlated to survival. The social safety net means Inuit can live in larger communities, such as Iqaluit where 4,000 - 5,000 people reside permanently in a small municipal area. While kinship usually applies to people related either by blood or marriage, the Inuit extended this term to include friends, neighbors and associates. By certain rituals these individuals all became one's relatives. A common way to unite families in Inuit or any other society is through marriage. Another rite practised in traditional Inuit society was child betrothal; parents customarily pledged their children to a future marriage. This drew the parents of the betrothed children into a kinship alliance, even if the marriage never took place. Another means by which an individual was made kin was through adoption. Inuit adoption, however, created more than a bond between the adopted child and its new family. It created a link between the new parents and the natural parents. All these new links served to establish bonds of co-operation and trust between previously unrelated people. Even partnerships, be it wrestling partners or singing or hunting partners, created kinship bonds. The use of namesakes created yet another bond. Naming a child after a recently deceased person meant that the child belonged to two families: the original and that of the namesake. 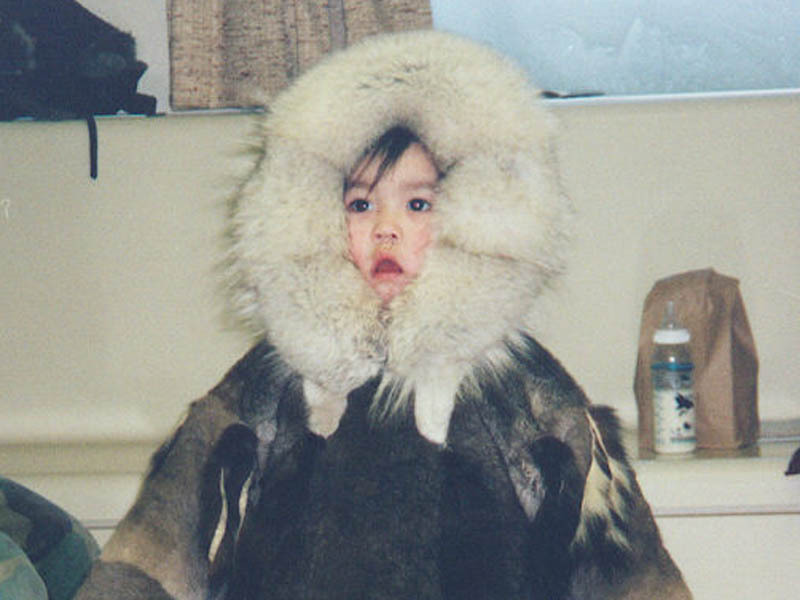 Today Inuit in most Nunavut communities are closely related. Marriages, extended families and custom adoptions continue to form bonds of kinship. This is not as much a survival mechanism today as it is a vestige of traditional life, and a function of the cultural and geographic landscape. In traditional Inuit households, children were treated with patience and gentleness, and in response, children were seldom unruly. Slapping and scolding were not regarded as acceptable forms of child control. Proper behaviour, through, was achieved through other means. The Inuit considered generosity, mildness and gentleness to be very good traits. Since their society relied on the co-operative effort of all its members, these traits became indispensable. Losing one's temper, on the other hand, was considered disgraceful. Moreover, a rash angry act could threaten the well-being of the community. Children developed certain traits through a subtle process of social pressure. Negative qualities such as petulance were ridiculed while positive qualities such as unselfishness were rewarded. One of the most severe forms of punishment was withdrawal of affection. In a society that relied on member's cooperation, there was nothing more life threatening than isolation. A child was never denied a wish, although an adult would try to modify a child's unreasonable request. A small child would be allowed to play with a very sharp knife, but quickly someone would distract the infant with affection and another a substitute for the knife. In other circumstances, experience was considered the best teacher. Older children for example quickly learned that knives were very sharp: one good nick usually taught them to be careful. Today Inuit life is very different. Schools throughout Nunavut teach Canadian curriculum from K-12, with aspects of cultural immersion and inclusion. Inuit children today spend as much time in front of computers and cable television, as children anywhere in Canada. 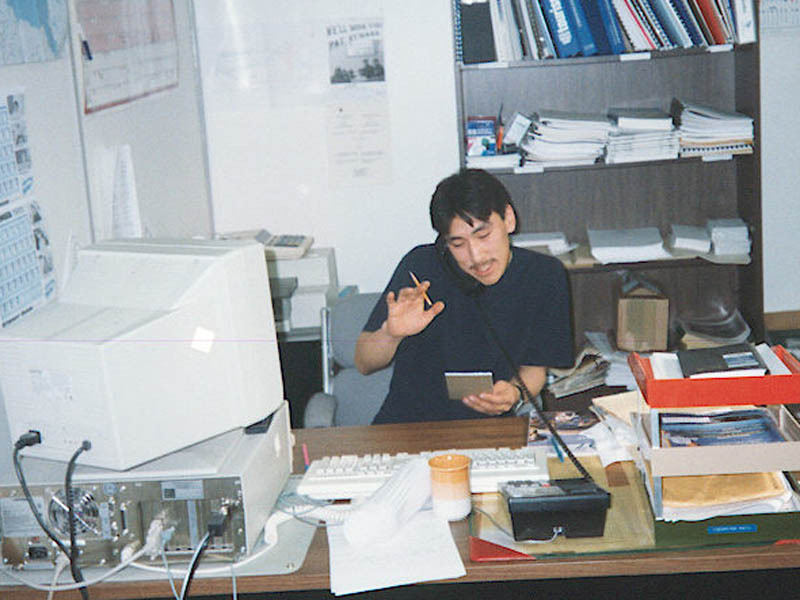 By December, 2000, every Nunavut commmunity will have a local internet server and Inuit children will be connected to the world wide web. Education took place within the family and the community circle. By constant exposure to their parents and other adults in the community, children learned all they needed to live successfully. The Inuit of old did not have a written language, so skills and knowledge were passed down by word of mouth. After a successful hunt, for example, the details would be shared with the community. The children, boys in particular, listened to reports of the hunters' latest venture and learned from them. The hunters would describe in detail the location where they spotted the animal. They would give elaborate accounts of the animal's behaviour and how they responded to that behaviour. Besides listening to the hunters' stories, the children enacted their own hunts by watching animals and observing their behaviour. They also tried to stalk animals, which required great patience. But being patient was part of life and children learned this too. If a family was confined to the igloo because of a storm, children entertained themselves. After all, bad weather or sickness couldn't be controlled: one simply learned to live with it. Waiting was a part of life. Ajurnamat, the people would say: "it can't be helped." Another important aspect of children's education was learning to orient themselves in their surroundings. Children learned from an early age to memorize the landscape. In traditional Inuit society there were no laws as we know them today. Taboos and rituals, however, did restrict behaviour. Fear of criticism and rejection were two strong forces that controlled people's actions. 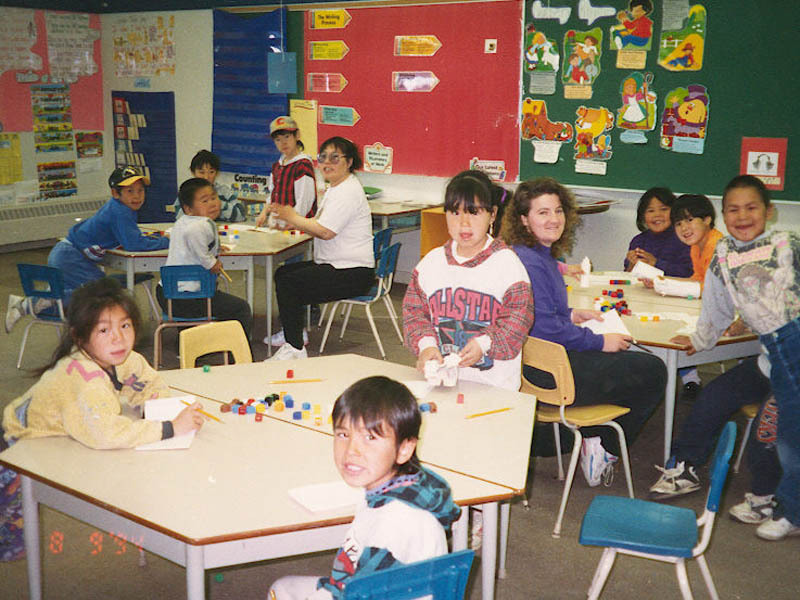 Today Inuit attend elementary schools and high school, and are subject to federal and territorial laws which are administered in every Nunavut community by the RCMP and municipal by-law officers. There are also restrictions and licences required for the handling of firearms and the hunting of animals, monitored by the Nunavut government's renewable resource officers. Many Inuit today can read and write both English and Inuktitut, and much of their oral history has now been written down and documented. The language of the Inuit (Inuktitut) existed without written form until missionaries went North in the 18th and 19th centuries. But the Inuit possessed more than an oral language. They also maintained a non-verbal language that relied on body expression and other cues to display feelings. So, the Inuit learned to interpret human behaviour in the same manner they read animal behaviour. Inuktitut today, as in the past, reflects and reinforces the Inuit's culture and value system. Strong emphasis is placed on nature and its elements. There are dozens of words to describe snow, for in the north the weather can produce a wide range of snow conditions, and the quality of snow is of great significance to the Inuit. Only certain types of snow, for example, make good igloos. In Inuktitut there is no distinction between animate and inanimate objects. But distinction is drawn between things that are named and things that are not. The land, for example, has many names, as does man. Therefore, there is a relationship between the two. 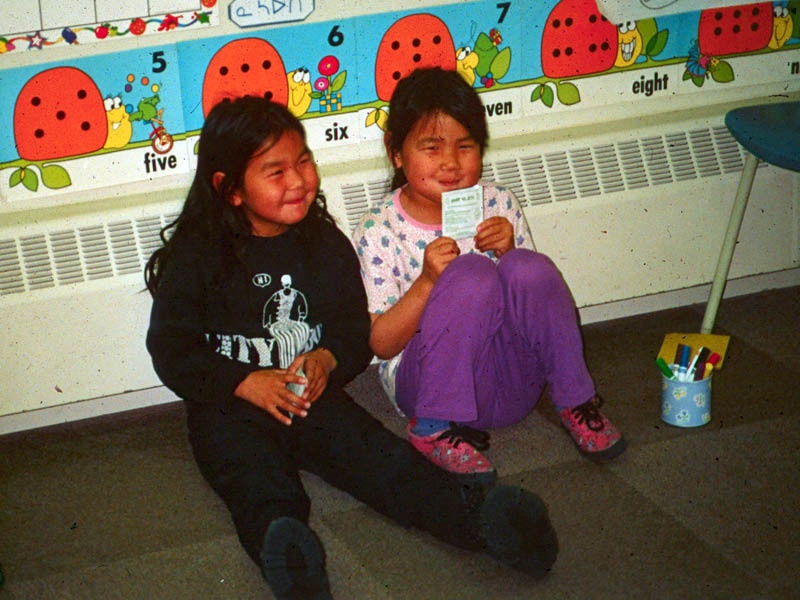 Today many Inuit read and write both English and Inuktitut. 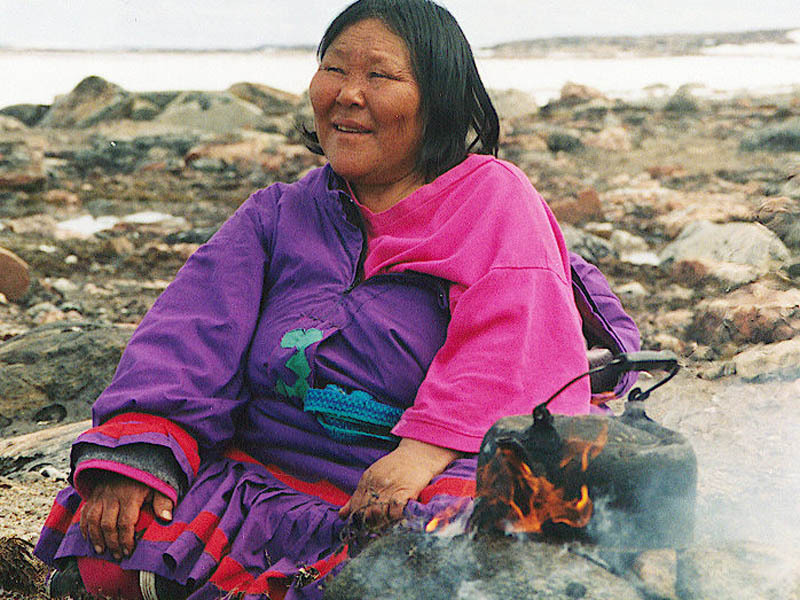 Middle aged and elderly Inuit are mainly unilingual in Inuktitut, or speak some English, while the younger Inuit are mainly bi-lingual. 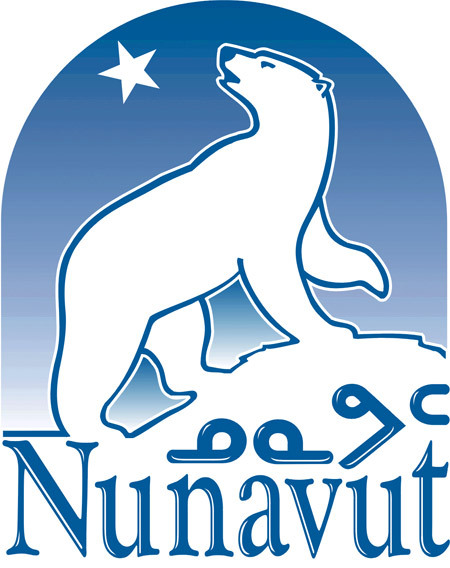 English, French, Inuktitut and Innuinuqtun (a dialect of Inuktitut) are the official languages of Nunavut today. The Inuit were, by and large, a healthy people. Their diet was protein rich and provided all the necessary nutrients. Major problems arose, however, during periodic bouts of starvation that could severely weaken a community and in some cases lead to the death of many members. In the treatment of common ailments, however, the Inuit relied on the herbs and plants they collected during the summer. They also made use of animal by-products in their healing techniques. Lemming skins were used as bandages and acted as an antiseptic agent. Caribou, seal, or bear fat was used for the same purpose. With the coming of non-natives to the north, the Inuit were exposed to many diseases. Having little or no immunity to these foreign illnesses, the Inuit died by the hundreds. During the early 1900's Spanish influenza hit the Labrador Inuit and destroyed about one-third of the population. In 1902 the majority of the Southampton Island population was wiped out. By 1910 the MacKenzie Delta Inuit population had dropped drastically. Today Inuit have health care provided by Nunavut Government. Each Nunavut community has a Health Center, staffed by nurses and community health workers. A doctor and dentist often do a circuit, travelling through 6-7 communities every few months to administer to the ill. Serious injuries are flown to Yellowknife or Iqaluit by regular airplane or on a medi-vac if it is an emergency situation. The medi-vac is usually a Lear jet based in a particular community, and is designated for medical emergencies. Most Inuit receive a high standard of medical treatment today, and attend hospitals for births, etc. The life of the Inuit was intimately bound to the natural environment, and in traditional religion this same emphasis was apparent. Religion and spirituality was in the form of nature worship. The unpredictable forces of nature were believed to be controlled by powerful spirits, and it was important to appease these spirits when they had been angered. This responsibility to protect people from spirits fell to the shamans - the Inuit medicine men or women. The shaman was the intermediary between the human world and the spirit one. When the sea goddess showed her anger by causing storms over the ocean or by witholding the sea mammals it was the shaman's duty to divine what had made her angry and what would appease her. This involved performing certain rituals. It was hoped that once the sea goddess was happy, the animals would become available to the hunters. It was believed that the shamans possessed magical powers, such as the ability to fly, turn themselves into animals or read people's minds. Good shamans were said to have healing powers and be able to cure illnesses by expelling evil spirits from the body. Evil shamans, however, were capable of murderous acts. Another traditional Inuit religious belief was that human spirits lived on after people died. The spirit of a deceased person would eventually occupy a newborn who had received the spirit's mortal name. The child, it was believed, would acquire its namesake's soul and abilities. 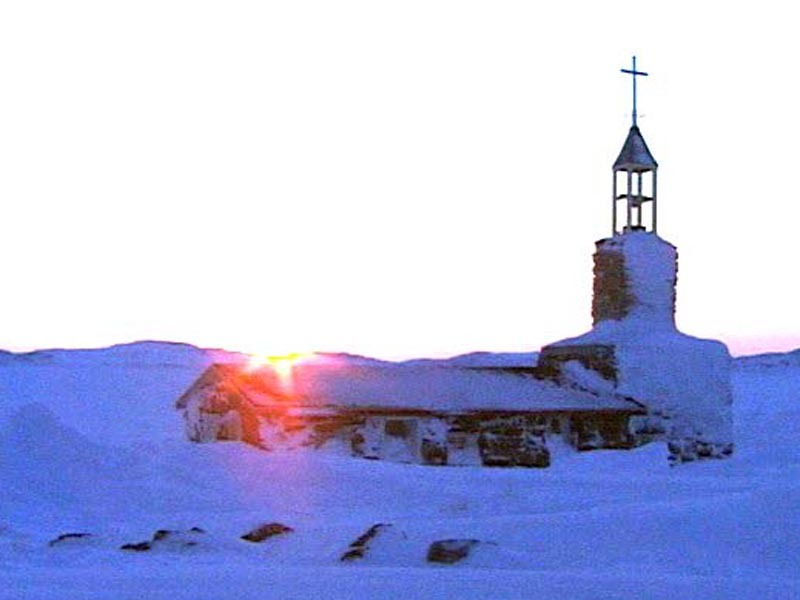 Today many Inuit follow either the Catholic or Anglican faith. Missionaries from these two denominations came to the Arctic in the early 1900's, bringing medecines, technology and faith. The Inuit were impressed and bought the whole package. Older Inuit still have faith in shamans, and their ideology is a blend of traditional beliefs and modern theology. Many of the missionaries were devout priests and ministers who learned Inuktitut and the Inuit culture and who passionately wanted to make life better for their parishioners. The life of the Inuit was not all hard work. As long as there was plenty of food and no immediate chores to be done, or when a severe winter storm kept everyone house-bound, there was time to indulge in pastimes. One pastime the Inuit children enjoyed was games. Children spent a lot of time outside playing tag or hide and seek or pretending to hunt. But there were other games for the young and old during the long, dark winter months, when there was little else to do. During winter, families were often restricted to their small igloos. Games served to break the monotony and acted as a release for pent-up energy and emotions. Since it was considered disgraceful to show open hostility, games became a safe outlet for such feelings. Games were also geared to enhance societal values. Feats of strength such as wrestling kept men in good physical shape. Other games such as arm-pulling tested men's endurance. The high-kick tested one's agility. In every aspect of the Inuit culture high value was placed on group achievement rather than self-achievement, and games were no exception. Grudges were never held against the winner, for the winner ultimately was responsible for the well-being of the loser. A toy called an ajagaak was played to sharpen the senses. It consisted of a small pointed bone attached by sinew to a larger bone with a hole in the middle. Holding the bone spindle, the player would swing the larger piece and attempt to jab the spindle through the hole in the center. While some pastimes were tests of physical endurance, others tested the mind. One such game was cat's cradle, which encouraged innovative thinking. A round of sinew was stretched between the players two hands. The participants fingers were used to form a series of loops that resembled, for example, animal shapes. The person creating the most shapes which no one could duplicate was the winner. The Inuit were also great storytellers. Some stories were accounts of the latest hunt. But the Inuit also maintained a large repertoire of legends, many of which their society's values and stimulated the imagination. Numerous stories traditionally told by the Inuit show the close relationship between nature and the people. Some stories are morality tales about truthfulness, unselfishness and other desirable traits. Today Inuit enjoy volleyball, basketball, badminton, ice hockey, and curling. Most communities have a school gym, a community hall and an ice hockey rink with one or two sheets of curling ice available. During the long winters various tournaments are held and people often travel from neighboring communities to compete in a variety of sports. Athletes battle not just for their own prestige, but for their home community, and the competition can be quite intense. 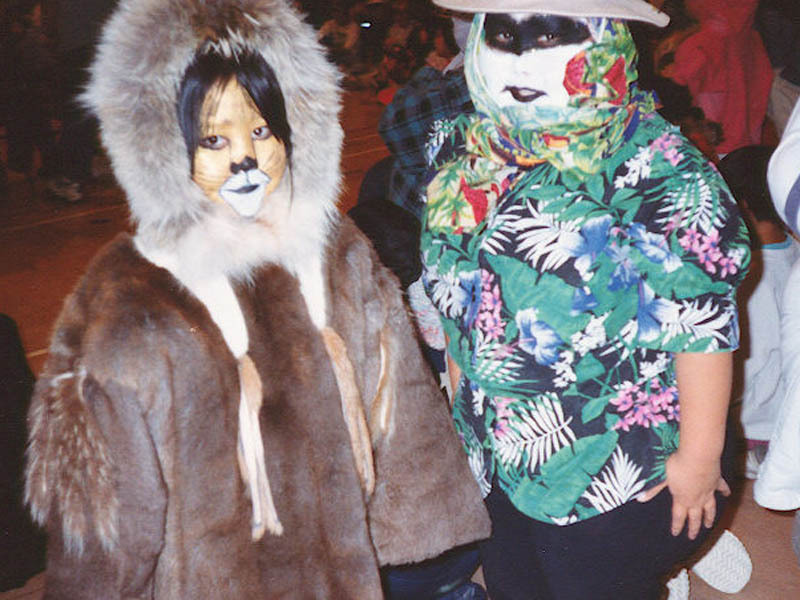 Inuit also celebrate Christmas, Easter and Halloween, among other occasions. 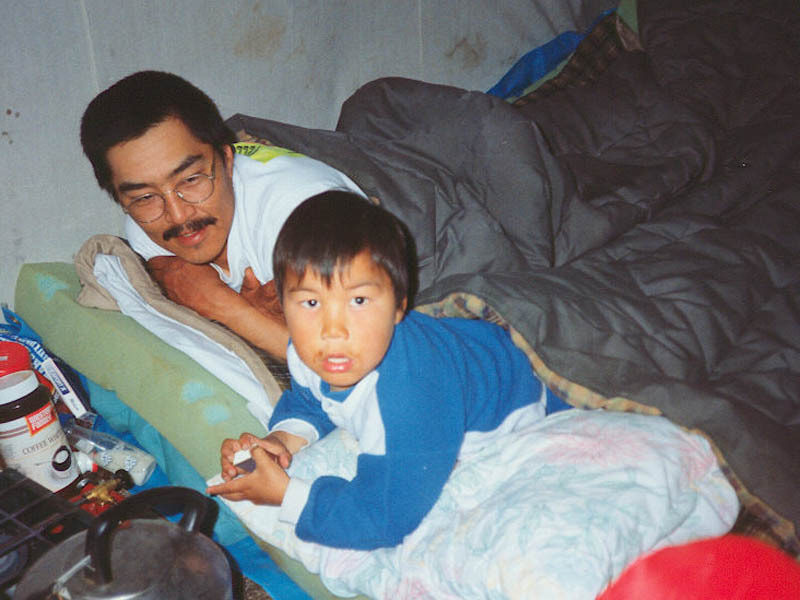 Many Inuit children have computer games at home as well as Nintendo 64, Gameboy and Sega. The long winters and often adverse weather encourage stay-at-home activities. 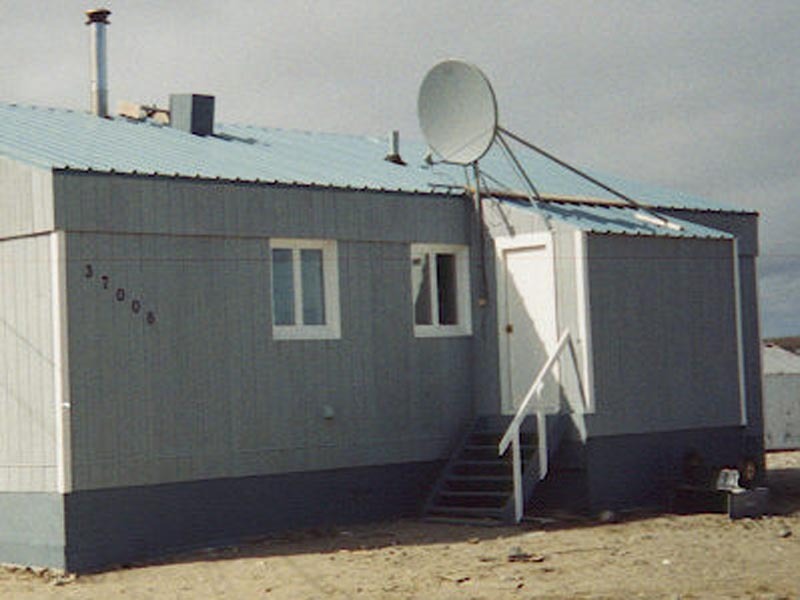 The advent of satellite technology has introduced cable television, and internet service in Nunavut through an array of community satellite dishes. The drum dance combined music, song, dance and story. It was performed by an individual or by a group, depending on the custom of the area. In the eastern arctic the drum (made of animal skin) could be a meter in diameter. It was held in one hand, with the wrist rotating the drum back and forth. As the drum was rotated, its rim was hit with a stick held in the other hand. The drum dancer, who could also be the drummer, moved rhythmically, acting out the imagery of the accompanying song, usually a personal story. Women in many northern communities, particularly in the eastern and central arctic practiced a form of singing called throat singing. Two women facing each other made guttural and resonant sounds through voice manipulation and breathing techniques. Often, the resulting sounds imitated the sounds of the north - the northern lights, the seashore, the wind - and evoked similar images. Some Inuit created sounds from a goose feather similar to those produce by a juice harp. Today Inuit enjoy community feasts and dances. 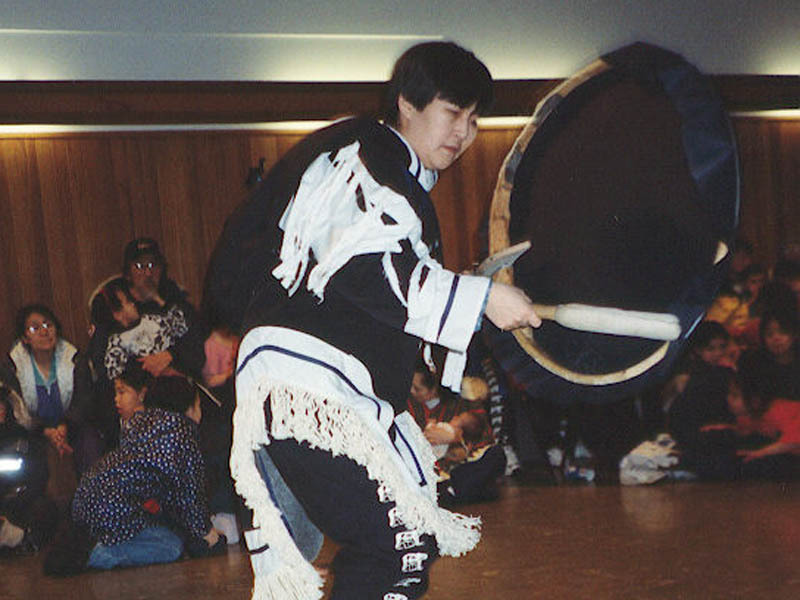 Drum dances are still common in many Nunavut communities, as are electric guitars and rock and roll bands. Music CD's and music channels on television have introduced the latest pop music groups from around the world to the Inuit culture. 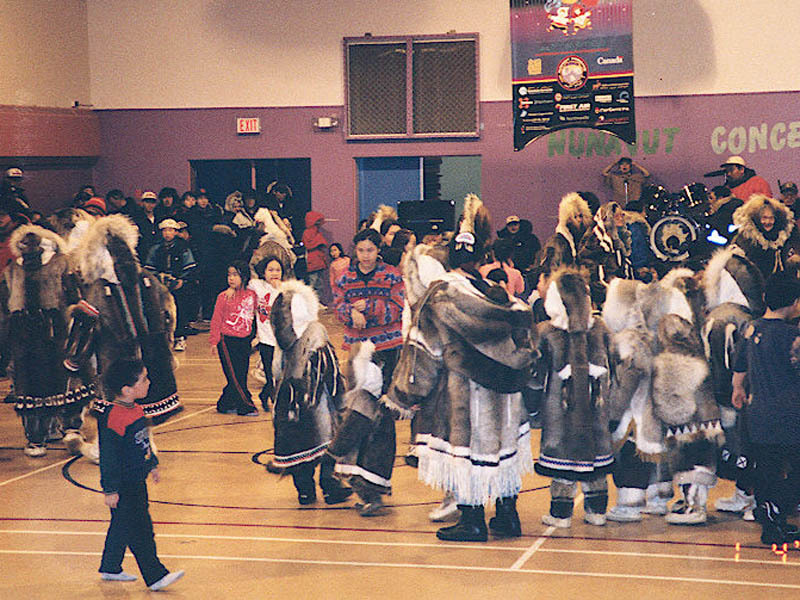 While throat singing and traditional dance are practiced by the older Inuit, the younger generation prefer more contemporary styles of music.